Notepad: After completing this puzzle, draw a line connecting the circles, starting and ending at the first circle of 62-Across, to spell a five-word message. The connected circles will reveal a picture related to the puzzle's theme. (Note: Rounded edges look best.) To complete the effect, draw a line between the circle at 36-Across and the circle at the third square of 37-Across. I was Magritte's "Son of Man" for a Hallowe'en party a couple of years ago. The decision, however, had a fatal flaw: it was my Hallowe'en party and I was playing bartender. Seeing, I learned later, is a useful sense to have when preparing drinks for public consumption. "Seeing is not believing" could be a warning drawing from the subject of this puzzle. The construction came together rather quickly, because I always needed to think several steps ahead to ensure the viability of its completion. For the pipe itself, I knew it needed to possess a convincing likeness once it was drawn, and I was intent on honoring the original proportions as much as possible. So I put an image of "Treachery" into a vector graphics software, overlaid a 21x21 grid on it, and set out to find the key vertices of the pipe, seeing where they landed in the grid. These spots would correspond to the squares with circles in them. I also did some of manual testing in one of those science notebooks I somehow still own, despite completing zero scientific activities on a daily basis. It was only then I realized just how much the luscious, round edges of this pipe contribute to its sensuality, hence my "rounded edges look best" direction. 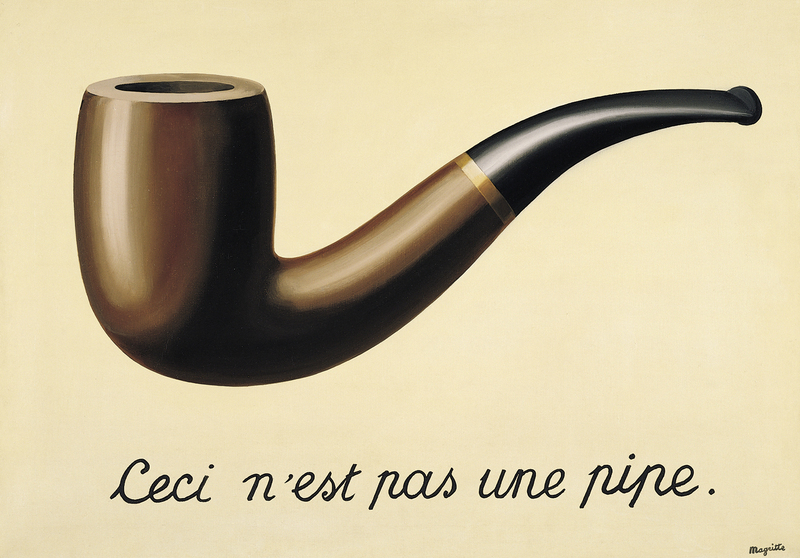 Because the text "Ceci n'est pas une pipe" is so iconic, and a fundamental visual component of the painting, as opposed to being a paratext, I knew it had to be included, in the original French. With the quotation on three lines, the title of the painting, and the other thematic material, there was no way this was going to make it in as a regular entry. Yet, at 17 letters, and hence 17 points in the outline, the phrase gives just enough resolution for the image (better than 14 for "THIS IS NOT A PIPE"). Once these proportions were determined, they were fixed, though the image could be moved vertically within the grid, and I could start the phrase at several points (I limited the possibilities to the left side: so the circles at 29-, 36-, or 62-across). Getting the title of work in the interstitial line without circles and finding out the"I" at 85-across could pull double duty was a crucial step toward getting that central section to work. 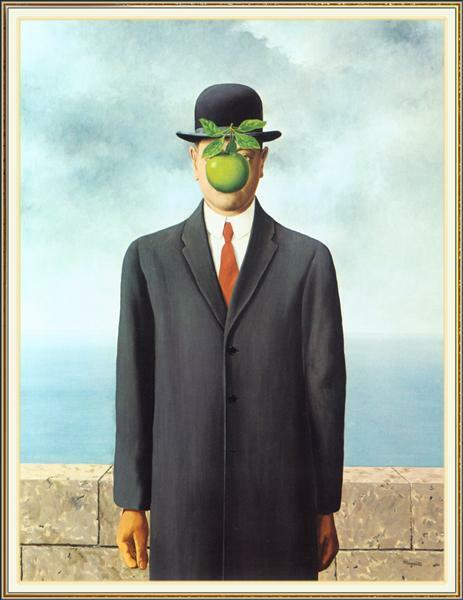 I do wish MAGRITTE could have been in the very last slot, to echo the extreme corner position of the signature in the original image, but the crossings wouldn't allow it (it barely allowed the present corner to happen). Thanks as always to Will and co. for helping get this out into the world. A couple of notes here: My original title for this puzzle was "WHAT YOU SEE IS...". The central bottom box was also revised from the submission (I had, under IS IT NOT: CEO, EXT, STE; not sure if EXT and STE are less desirable than OXY and DTS.) I had a lot more wordplay in the original clues, but maybe some were imprecise, or too oblique: SELFIE was "Single shot?" EMITTERS was "Ones with issues?" NOTE was "Staff pick?" The clues for LAB NOTES and TROUPE, however, made it through. In the end, this puzzle is not only an homage to Magritte, but also an homage to the typology of puzzles: apart from being a tribute, it has circles you connect to make an image, a quotation, and even a bit of thematic wordplay with 120-across. It's also an homage to paper [solving]. Hopefully, the surrealism of the original painting gains a new dimension here: a representation of a representation. The (benign) joke, which was the reason "Treachery" was so enticing to invoke, is on detractors of this theme: if you finish the puzzle, play your bonus round of connect-the-dots, and declare "that's not a pipe!" or "that isn't anything like a pipe!," you'd, of course, be fully correct. Ceci n'est pas une répétition. As a recent crossword reminded us, simultaneous invention is common in science and technology. The same thing happens in puzzles when constructors get similar ideas, even if their executions are different. A diagramless last April by David Steinberg, one of my favorite Variety puzzles in the past year, tackled the Treachery of Images in a grid you had to build yourself. It's such a shame that David Steinberg's puzzle was so recent – and so beautiful! I don't know much about art, but I loved learning about it through David's diagramless. This particular painting has such an interesting story and message behind it. It's a fantastic blend of art and logic – it's obviously a pipe … but the caption begs to differ. I love me a good paradox! Although my wow factor was diminished because David's puzzle was stuck in my memory, not nearly as many people do the variety puzzles, so I'd bet most solvers will still have a neat experience as they read up on the painting. Or, if they already knew about it – fine, I'm an art dummy, are you happy? – they can appreciate how closely the shape of the pipe is mimicked by the circled letters. I also liked that Andrew included the "explanatory" quote: "it's just a representation, is it not?" I admit that I don't fully understand that, but the notion behind it amuses me. Even though all those circled letters plus the themers added up to a ton of constraints, I appreciated that Andrew worked in some fine brushstrokes: HUMAN RACE, MARS ROVER, DOG TREAT, CAGE FREE, FUEL TANKS. I didn't get QB RANCH at first until I (head slap) parsed it to Q BRANCH. I thought as a huge Bond fan I knew everything there was about the series – apparently not! I bet Daniel Craig would be a good quarterback. I do wish that the full caption, CECI N'EST PAS UNE PIPE, had been underneath the pipe so as to better copy the painting (even if that meant not using the quote). And a connect the dots from A to B to C would have been easier to follow, especially if you didn't already know C E C I N E S … what a confusing mess of letters. But overall, I liked Andrew's take on the famous painting almost as much as David's. Answer summary: 7 unique to this puzzle, 1 debuted here and reused later, 4 unique to Shortz Era but used previously. Average word length: 5.20, Scrabble score: 549, Scrabble average: 1.51. Puzzle has 10 fill-in-the-blank clues and 7 cross-reference clues.